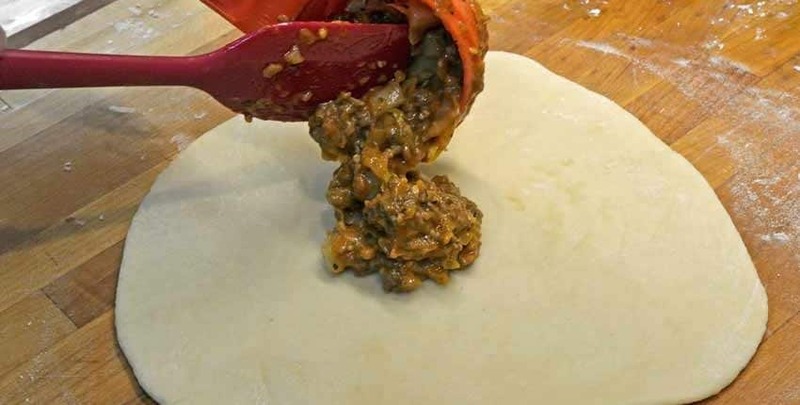 All over the world, working folks have eaten hand-held lunches of meat or vegetables wrapped in dough. Not sandwiches, but delicious and filling sealed, portable, savory pies – bringing energy for the afternoon work they faced. 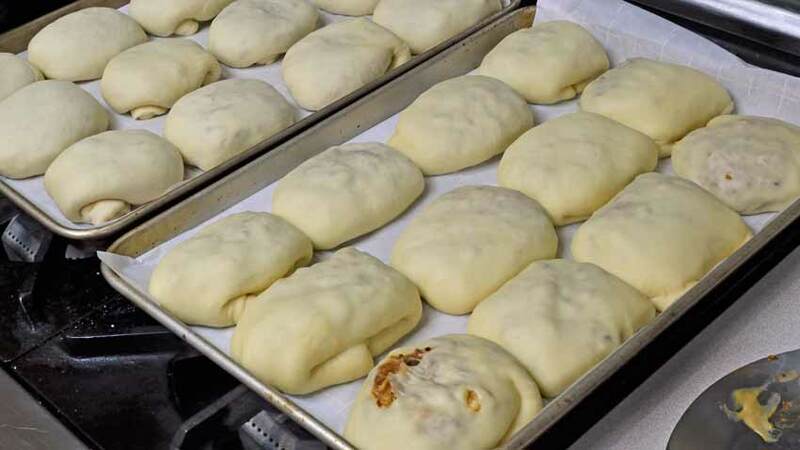 Many of these international specialties have found a welcome home in this country, and this example comes from the 18th-century Russian Mennonite farms by way of south-central Kansas, where they emigrated to. Traditionally tucked into a basket or hamper and brought to the farmers at their mid-day lunch break, they are a hearty and delicious way to enjoy a good meal on the go today. They are great fresh, but also keep in the refrigerator and freeze well. 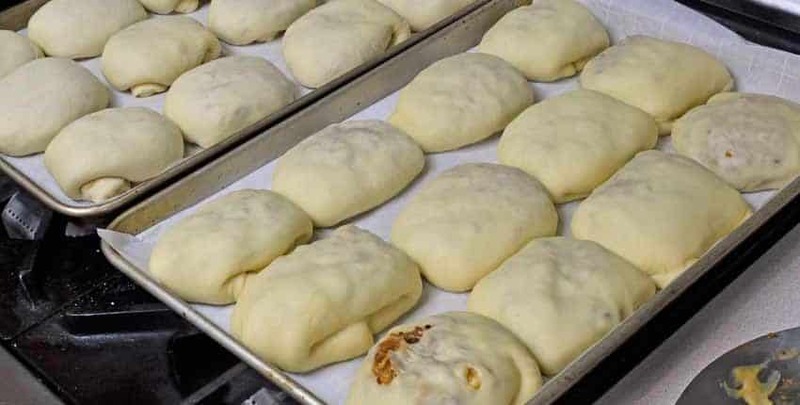 Let them thaw before reheating to get a taste of fresh, homemade goodness anytime! 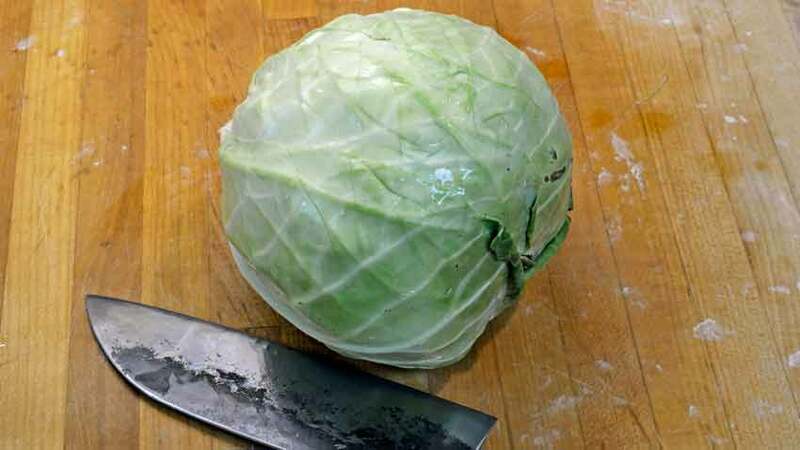 Danish Ballhead cabbage before chopping. 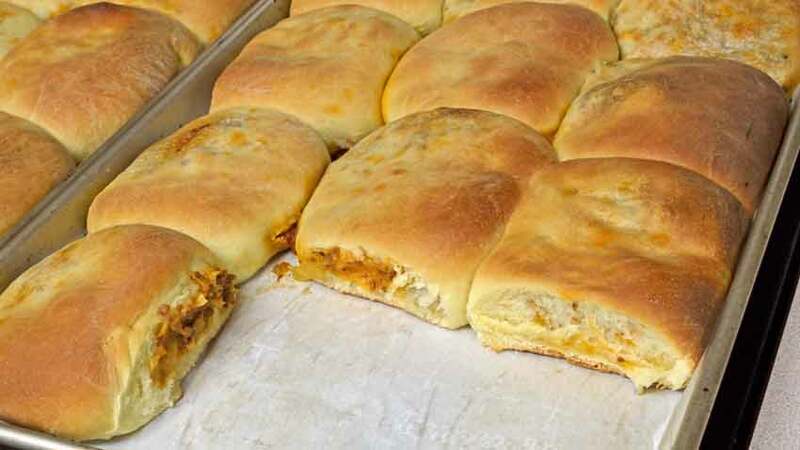 Bierocks perfectly showcase fresh, home-grown cabbage as a foil for the richness of seasoned ground meat or other roasted, savory vegetables like mushrooms or beets. 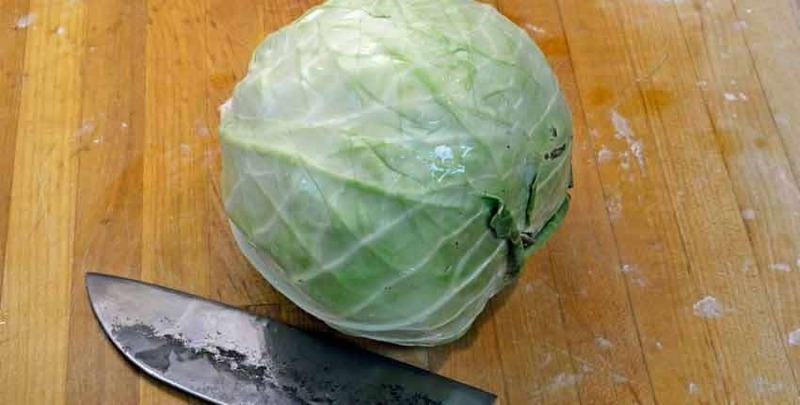 We used a freshly harvested head of Danish Ballhead cabbage that was sweet, tangy and crunchy! Grow your own cabbage here! 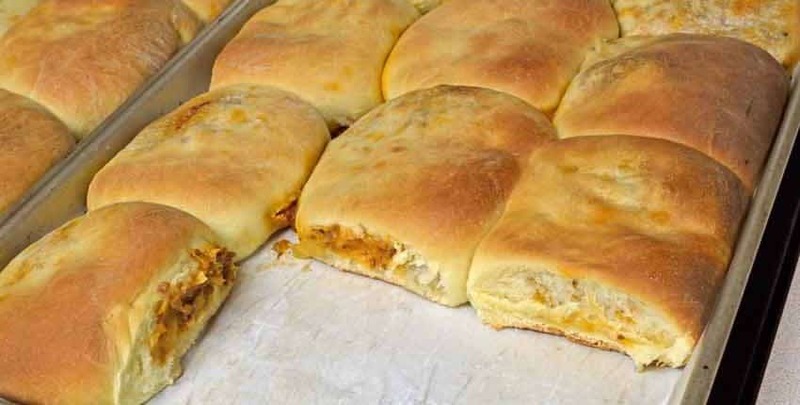 …and filled with the savory filling. Equal parts ground beef mixed with cabbage is traditional, but any seasoned ground meat is just as tasty, or use portobello mushrooms sauteed in Worcestershire sauce for a meatless variation. Bierock with the ends folded underneath. …fold the “tails” or ends underneath and seal them with a strong pinch. 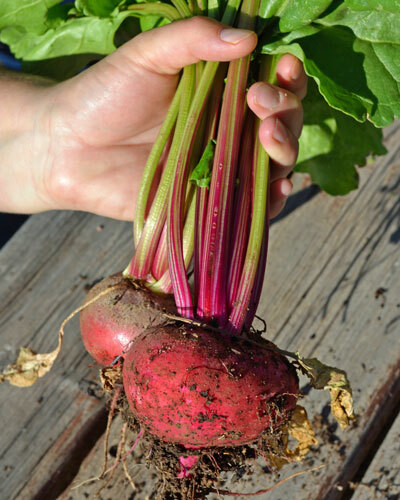 …then pop them into a hot oven for 15 – 20 minutes, or until golden or golden-brown on top. They are ready to serve after sitting for a few minutes, or you can make them ahead of time for a party or trip. 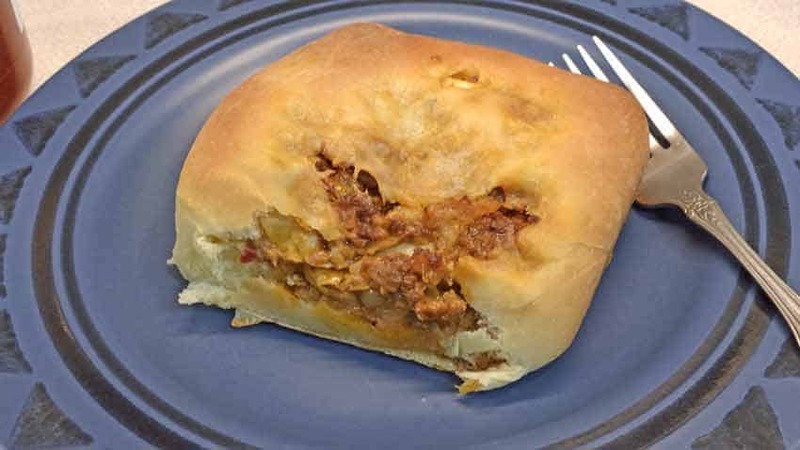 Bierocks re-heat well and make a satisfying field lunch when spending the day outdoors. These hand-held working lunches were traditionally served in the field and stuffed with meat and cabbage fillings. Today they're enjoyed anytime and can easily be made vegetarian. Dissolve yeast in 2tbs warm water in a small bowl. Mix together flour, sugar, and 1/2 tsp salt in a large bowl. Add milk, 8 tbs butter and eggs to yeast, mix well then stir into flour. If the flour is too dry and crumbly, add water 1tbs at a time until a dough ball is formed. Turn dough out onto a lightly floured surface and knead until elastic - about 5 minutes. 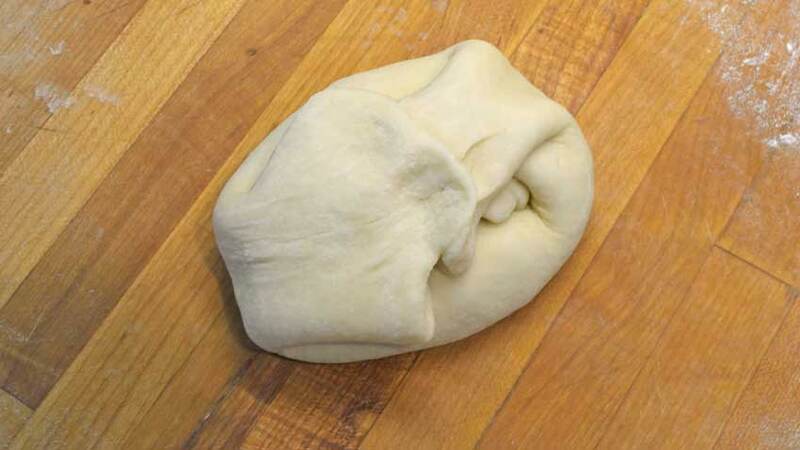 If using a stand mixer, use the dough hook to knead, then turn out and test elasticity by hand kneading. Put dough into an oiled bowl, turn it to coat with oil, cover with a cloth and set aside in a warm place to rise for about 30 minutes. 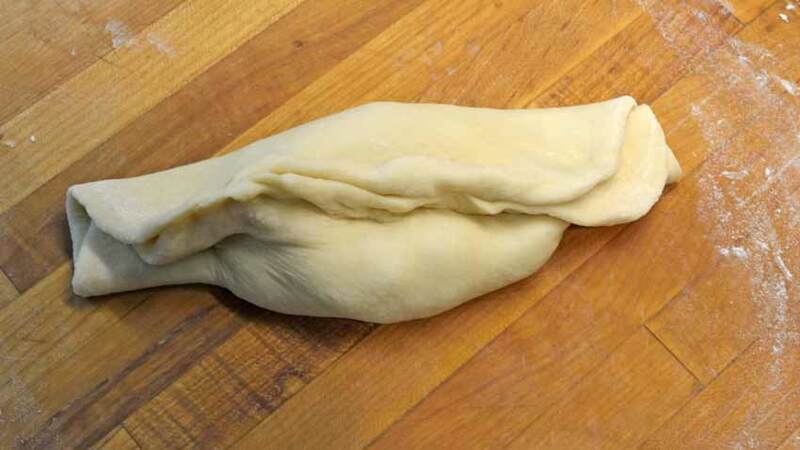 Once the dough has doubled in size, punch down, cover and let rise for additional 30 minutes. 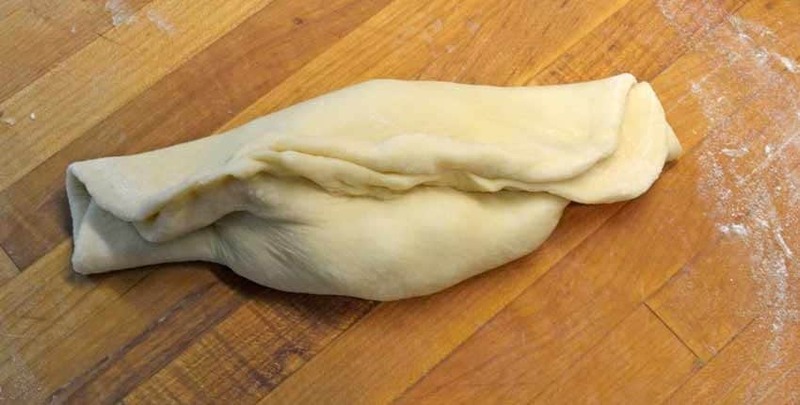 While dough is rising, make the filling. Heat 2tbs oil in a large skillet over medium-low heat. Add onions and cook until soft and starting to brown - about 15 minutes. Increase heat to medium-high, add beef, and brown for 8 minutes. 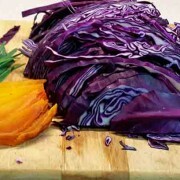 Stir in cabbage, cook for 10 minutes, then add cheese and mustard and season to taste with salt and pepper. Simmer for 5 minutes more, then set aside to cool. Preheat oven to 350°F. 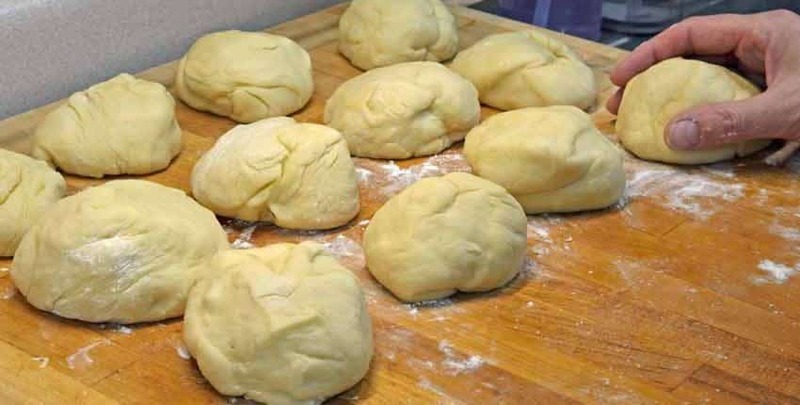 Return dough to a floured surface and divide into 12 equal balls. Roll out into 6" rounds and spoon about 1/3 cup of filling into the center, then fold edges together and pinch closed. 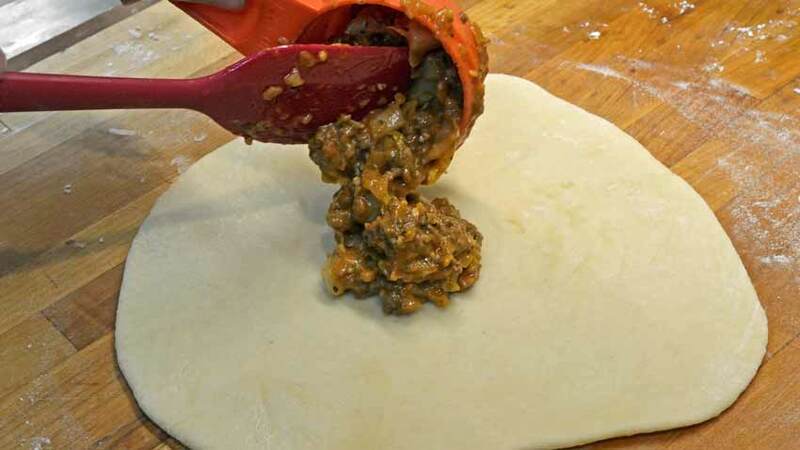 Fold tips together and pinch to seal, then place seam side down on an oiled or parchment-lined baking sheet. Let rise for 20 minutes after all bierocks are made, then bake until tops are golden, about 15 - 20 minutes. Serve either hot out of the oven, warmed up or cold depending on your need. Let us know how you like them, and what fillings you use in yours!